I Take it Back. I Take it All Back | Food It Yourself! I’ve stated many times on this blog that I’m not going to show how to make yeast bread because you should learn in person from a friend. I take that back. I have found the DIYeter’s Holy Grail and I have to share it with you. I have discovered the wonder that is batter bread. Quick and simple to put together, this is sandwich-worthy yeast bread you can totally make tonight and toast tomorrow for breakfast. Or for a bedtime snack. Let that sink in for a minute. Bonzai is not contemplating batter bread. 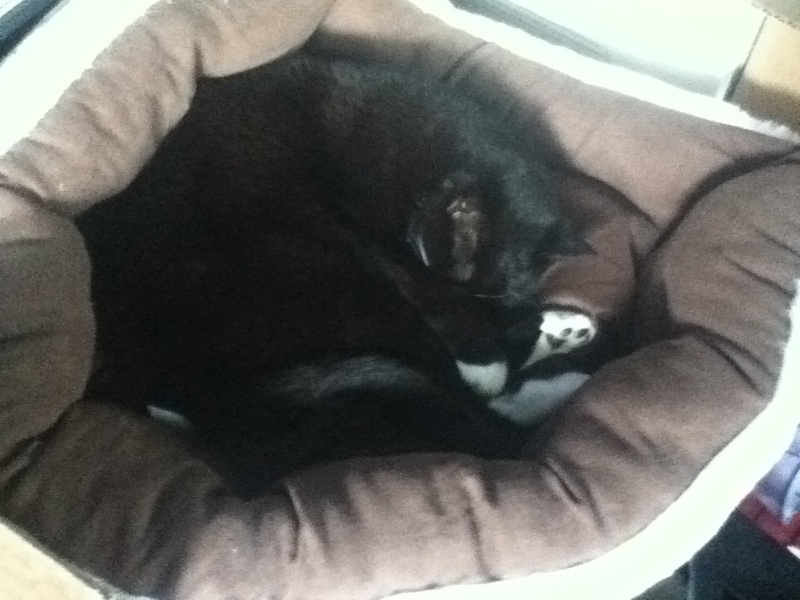 He is a cat. Here is the recipe I am quickly learning by heart. I add a (quick) step at the beginning of the recipe- a sponge. It is a technique I learned from the cookbooks of the amazing Mollie Katzen. It wakes the yeast up and, I think, helps the raising go faster. For this recipe, mix the yeast, water, and ½ cup of the flour in the bowl of your mixer. Add a drop of honey or ¼ teaspoon of sugar and mix it with a fork or a whisk. Go do something else for 10-15 minutes. When you get back you should see little bubbles in the mixture. Bonus- if you think your yeast might be too old to work you’ll know right away and you will not use up all your flour on a batch that won’t rise. 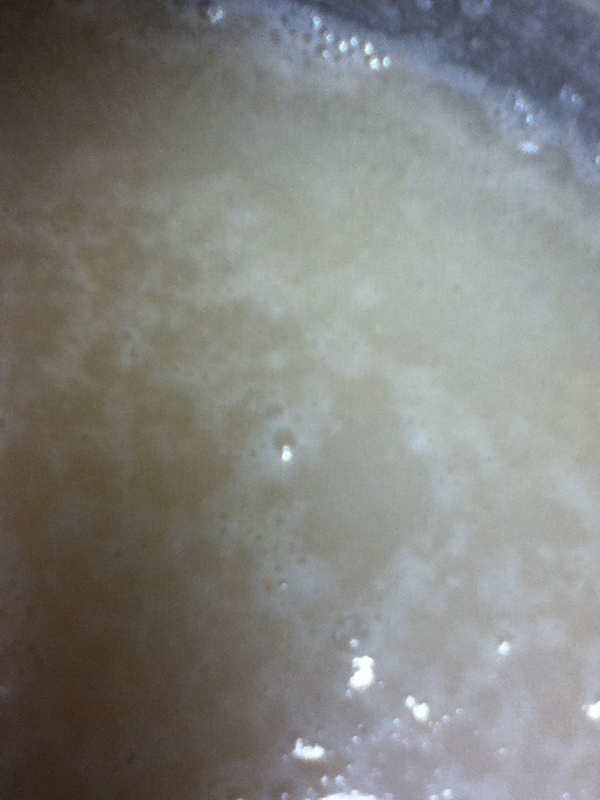 Not the best picture, but you can see the little bubbles the awakening yeasts have belched out. 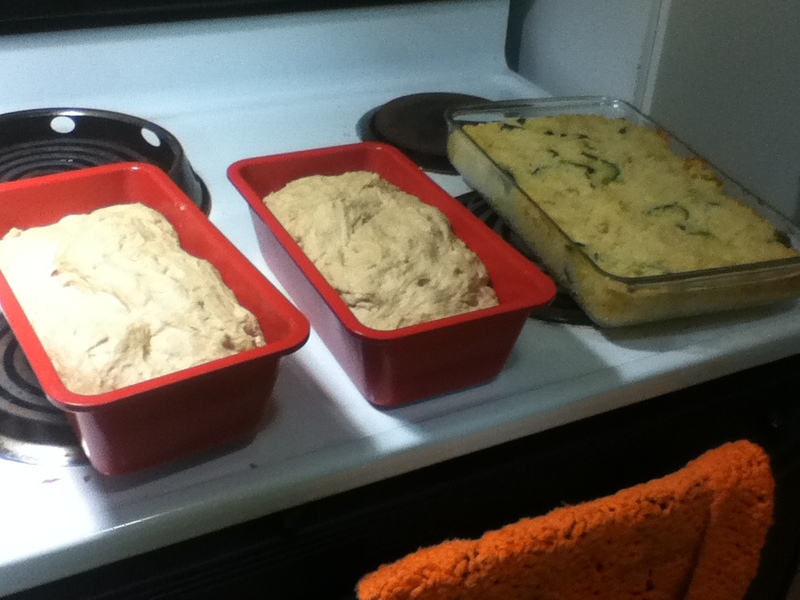 I do the first mixing step with 4 ½ cups of flour added. If I only use 3 ½ the thin batter splatters when I turn the mixer on high. You don’t need bread flour. You can use all-purpose flour and add a little vital wheat gluten. You can find it near the flour in the supermarket. The box will tell you how much per cup to add. (Each brand is a little different.) Or, just use all-purpose flour and mix it longer. Seven to ten minutes should do it. For that matter, you can vary all kinds of things in this recipe. I use “white whole wheat” flour. It’s just whole wheat flour ground extra fine so the texture is more like white flour. The oil could be soy, canola, olive, avocado, sesame, whatever you like. The sugar can be white, brown, turbinado, maple, honey…just use what you have. 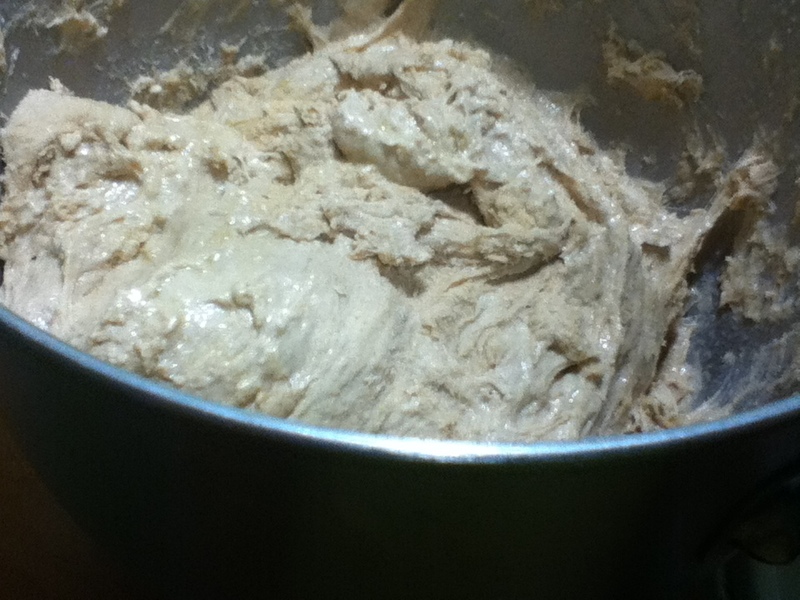 You will end up with a thick batter or a soft dough. That’s another thing the recipe omits. 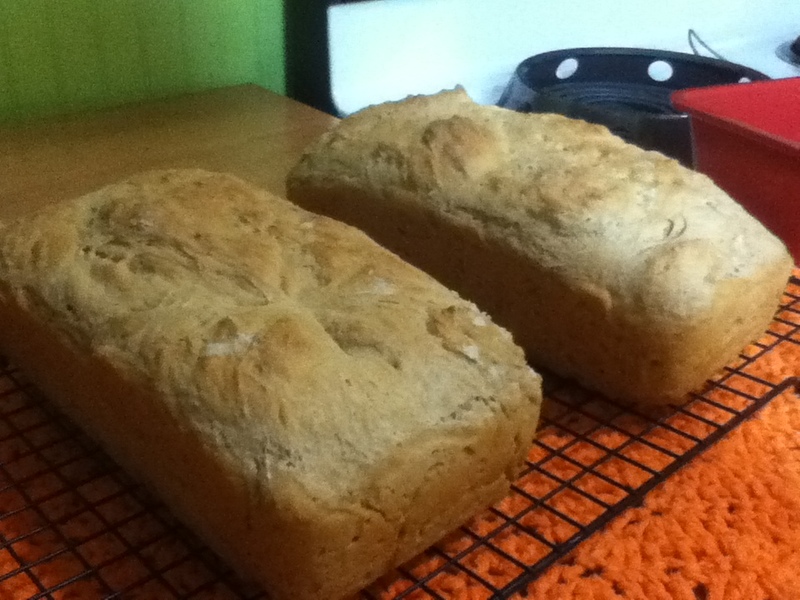 Every time you make bread, even with the same recipe, it will be just a little different. Embrace the chaos. When stirring in the last 3 cups of flour (or two cups if you started with 4 1/2 in the mixer) you can add all kinds of amazing stuff- herbs, cinnamon, sun-dried tomatoes, roasted garlic cloves, crumbled cooked bacon- the sky is the limit. Dinner is out, bread is in. The second raising was completed at exactly the right time. They even cook at the same temperature. I hope you are psyched about the possibilities batter bread presents. I really, really hope you try making batter bread. Give it a try! Seriously, it’s not hard. ← What the ?^@! happened? Pingback: You Don’t Knead It but You Need It | Food It Yourself! Pingback: Following up | Food It Yourself!